Is your backyard the place to go when everybody in the neighborhood is jonesing for a barbecue? 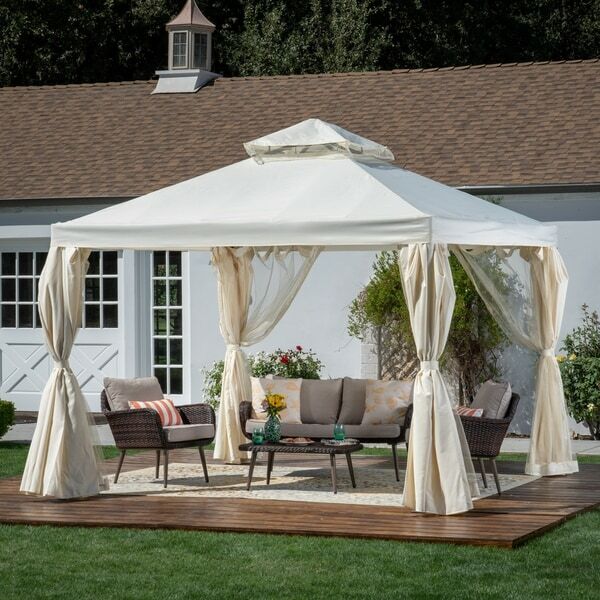 Your next outdoor shindig is about to receive a major upgrade - this gazebo will provide cool shade on those sweltering summer days, and a cozy, romantic place to light a couple of candles for more adult affairs that last well into the night. No matter where you live, this piece is an absolute must for the enterprising homemaker - it will ensure that he party will go on, rain or sunshine. Dimensions 117.5 In. X 117.5 In. X 108.5 In. "Does it have a zipper or velcro to close the panels? Does it also have mosquito netting?" Yes, it has mosquito netting, but there is no closure to the panels. "Does it include mosquito netting? Is it waterproof / rain proof"